For some reason, I've always liked the Botanics line from Boots and have more than a few items on staple. They are affordably priced and perform really well especially for my deep cleansing routines. With some weekly diligence and the aid of these sensible drugstore offerings, my skin has kept quite clear and smooth these days. Ah, this would be my favorite of all, and I have been using it for ever. I dislike the current packaging quite a bit (and grumble everytime I open a new bottle) because I do not think this particular formulation should be "spritzed". It is more like a gentle astringent and contains alcohol. I do not like the idea of closing my eyes tightly when I should be most relaxed. Luckily, I still have the vintage bottle (as you see in the pic above - isn't it pretty?) and pour the content in the glass bottle. For me, this toner is the last step of cleansing and I like using cotton pads with it, so it works better this way. I hope the folks at Boots will bring the old plastic bottle back if the hefty glass one is not an option anymore. Other than the packaging, it is pretty much perfect for me to finish the cleansing step and tone my skin. The realistic almost shy rose scent is pleasurable and refreshing. If you have normal to oily skin, do give it a try. Highly recommended. I am on my third tube and might try something else next time, but I find this quite effective to rid of impurities from wearing waterproof sunscreen and makeup. It contains some salicylic acid (from willow bark) to control acne yet it is not irritating at all. Don't get me wrong, though. It dries up pretty quickly on face and has that tight feeling, but it leaves skin supple and clean. I like using this once a week before shower (like all other mud based masks, it makes the sink messy). This clay mask doesn't sting, and rinses off clean and fast as well. I purchased this on a whim during the spring when I was looking for some light oil to occasionally mix with my foundation. This oil with medium consistency worked nicely for that, but I quickly started using it on its own whenever my face felt tight and looking uneven. The oil has a very faint herbal scent that is almost sweet. I also mix it with my unscented body lotion from CeraVé (another staple) to boost hydration. The dropper makes it easy. Lately, I've been doing deep-cleansing twice a week, and it has made a visible difference for me. These affordable and easy-to-find products from Boots are a big part of the routine, which I want to share with you below. It is fairly easy but could be too much for sensitive dry skin, so please keep that in mind. Apply cleansing oil and massage face gently yet thoroughly. You might feel some whiteheads are already loosened up and even come out of the pores. Rinse off. On wet face, apply a gentle exfoliator and massage. Gentle is the keyword here. Apply your choice of deep cleansing mask (Shine Away Ionic Clasy Mask for me at the moment). Let it dry. Rinse off. Tone and soothe with a toner (Rosewater Toning Spritz on cotton pads). Apply a few drop of facial oil (Boots Botanics Facial Oil) or a sheet mask (I like Hada Labo Shirojyun). I hope you enjoyed this post. Feel free to share some of your favorite skincare routines with me. You're still using the Rosewater toner! I decided to try other products, but I remember that my skin loved this. My skin has been so congested lately since I moved to Okinawa, which is even more humid than where I moved from. I'm thinking that I need to try this again. I totally feel you about the packaging. I have another toner in a spray bottle and I usually just spritz it on a cotton pad. Haha. And yes! 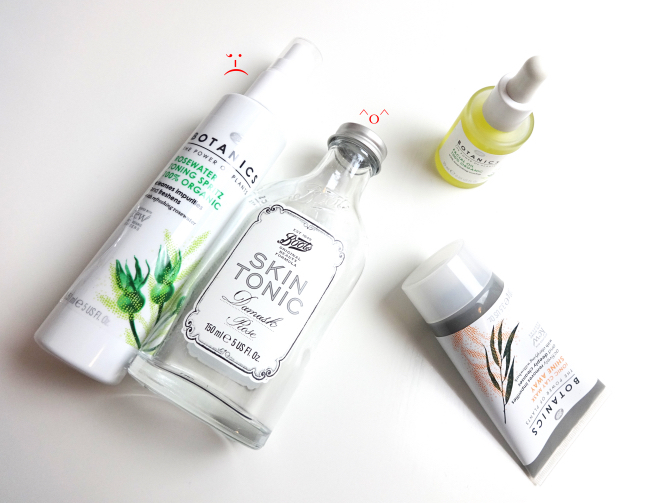 I also like the Botanics facial oil. It's so inexpensive and it's a good moisturizer. I liked to use it to seal in essences and lotion in the winter. I wasn't sure if you'd moved to Okinawa. I'm from Seoul where it can be terribly humid as well, but I hear it's hotter and more humid there sometimes. This is also why all those Japanese sunscreens are excellent both in protection and application (you should try some from Skin Aqua brand, which is my current favorite). And I guess any Japanese drugstore toner that says "sarasara" would be good to use after cleansing. I've only seen Boots brand sold in Winners (equivalent to TJMaxx) here and that's very rare too, not sure if I can purchase the brand in stores. I have been doing deep cleansing at least once a week too, the older I get, the more help my skin needs. Boots came to the states years ago and initially I was confused with their complicated lineups, but now I learned to stick with a few that work for me. Oh why did they go and redesign the packaging for the Rosewater Toning Spritz?!! The old packaging looks so much more charming and vanity worthy! Well at least what's inside the bottle agrees with your skin and you still have the old one that you can decant the product into. I added a weekly home microdermabrasion treatment to my routine recently. I rediscovered a device that I won at an event last year that I totally forgot about. I think I may've been a little overzealous the first time but I'm getting the hang of it now. I'm always amazed at how smooth my skin is right afterwards. The old bottle is very pretty and awesome, right? I think it is the very original when they first introduced Damask Rose toner. I like the bottle so much that I've kept it all these years.